RV.Net Open Roads Forum: Buying a Former Rental Class C. How many of us out there? > Buying a Former Rental Class C. How many of us out there? Welcome back it is great to hear that you followed thru and bought that RV from El Monte RV,I take it that is the one with 80000 miles on it,it looks like a very good deal. I like the solid front cap,less likely to leak that way also the large storage area in the rear,mine has very much the same thing,very handy. That sounds like a really good shakedown cruise of 2800 miles and you are happy with your purchase. I hope that you have many more fun trips with it,please come back and share those with us when you can. Happy Camping and as they say at El Monte RV "Goin' Places with Smilin' Faces"
Hello Everyone OP here again. It has been a little more than 2 years since I have given a progress report on my ownership of a Former Rental. I have completed my 7th consecutive successful week long Thanksgiving trip with my extended family. My usage has changed a bit since the last report, instead of long range trips where I only stayed a day or so, sometimes up to 3.I have gone more often, monthly, on shorter trips and stayed longer at my destination. This has included Casino Camping, some have FHU parks and others are dry camping. I still go to our county, state and local RV parks. I have spent more time camping and a lot less driving, I like this change for now. The nice thing about the RV lifestyle is that you can change it up to suit your pleasures at the time. As in my previous report, all the appliances are still in excellent working order and trouble free, all the doors, cabinets and drawers are working as they should and the fit and finish is still very good. All the tank sensors are still working as they should and the generator now has a bit more than 1200 hours on it without a single problem, if it hasn’t been run at least monthly I will start it up and put it under load for an hour or so. I have kept up all the routine maintenance, checking all seams and openings and making sure that they are sealed and weather tight, washing waxing and all fluid check and changes that are needed. I have encountered just 2 problems in the last 2 years. One was a water leak in the bathroom, it seems that the poor design of the toilet water module on my Thetford Bravura caused it to fail and start to leak thru the side of the unit after 8 years. It was an easy fix, one thing about this toilet is that the module is easy to get to and change without removing the toilet. The other was that I noticed that while driving my house batteries were not being charged from the engine alternator. I had my suspicions as to what it was, thru my own knowledge and what I have learned here on the Forum, but I went ahead and did the complete diagnostics from checking the grounds, fuses, and the bird. It was confirmed that it was indeed the continuous duty solenoid that I thought it was. I replaced it and now everything is working as it should. I found that they have a service life of about 10000 cycles, being 12 years old and 5 of that as a Rental I confirmed thru a RV tech that it had lived as long or longer than expected. I am very happy with my choice of this Former Rental and its performance; it has given me great confidence in its use and dependability and a lot of wonderful memories. I look forward to many more years of trouble free trips with family and friends or on my own. I hope others on this thread have had the same luck and dependability and would share with us how it is going with your Former Rental. Ok time to get back on the road, after all here in So California it is camping season year round. I'm finally back to this forum, spent most of 2018 working and not much RV'ing, but working on road readiness for this year. Everything seems in good working order, I did start everything up (engine, A/C, generator, etc.) about once a week and drive it around a few miles every so often to keep things in running. 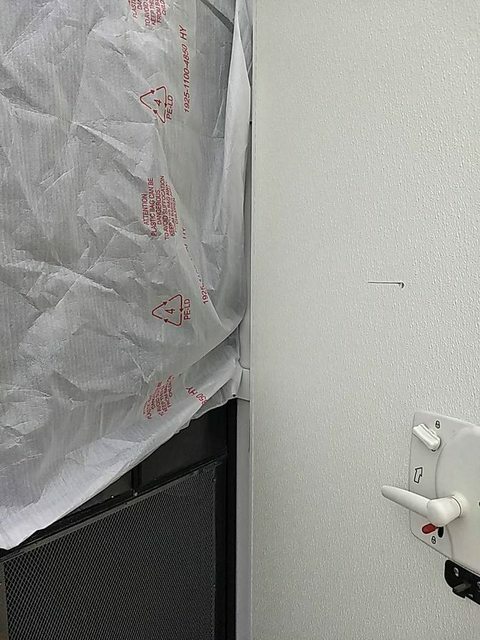 My question is, there is a replacement RV door window with sliding shade by AP Products for about $100, my 2011 Majestic 27G door does not have a window, can I just trace the replacement for fit and cut through the door to install it, since I am technically not "replacing a window"? Hey MtnBikeMarty #75 welcome back,it sounds good that you are getting your RV back on the road. about doing this.On page 3 the OP shows his work and how it was done. Although it is a trailer the procedure would be the same. Good luck on your project and when you finish come on back and tell us how it went. Thanks IAMICHABOD, that was the perfect link for exactly what I want to do! Going to pick up some new jigsaw blades and then go see if my local RV store (www.statetrailer.com) has it in stock, I know I can order it on-line for less, but I like to support local dealers (RV and bicycle dealers) when I can. That sounds great,glad to help.I saved that thread when I saw it just in case one of the owners of a Majestic wanted to do this.They seem to have started the no window in the door around 2010,I don't know why,it sure makes it dark inside and you can't see who or what is outside. I changed my window in the door from the frosted to the one I have now. If the one you are going to use was on the market then I think I would have tried it. Good luck on that mod. Hi is the window you are fitting have clear glass? We must have had one of the last 27G with a window but it had frosted glass. Changed for clear and it improved visibility for pulling out a huge amount. Good luck with the fitting. The kids think we have it made living in Andalucia, but having a great time in our RV in America. It has clear glass and a built in shade,this may be very handy. I finally got time to install a new window in my Majestic 27G coach door which had none to begin with. 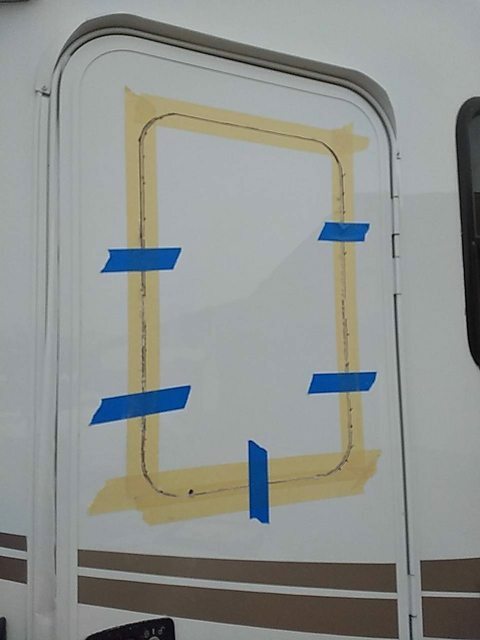 Bought AP Products 015-201512 Slim Shade Upgrading Your Door Window from my local State & Trailer Supply RV store for $8 more than on Amazon (ie support your local RV dealers and bicycle shop dealers). Bought new jigsaw blades (have spares on hand, I bent one during the curved cuts). I used the template cut out from the cardboard box, and traced it on to masking tape. As I cut I used extra tape to hold the cutout in place. I cut with the door closed but noticed Styrofoam pieces going all over my screen door so I covered it. You'll need a helper to hold/push the window outside while you screw the interior piece in. We also taped the shade a little on top and bottom, as well as taped the tinted glass in the corners, just to avoid catastrophes. I did not silicone the inside (the frame has a bead gasket where the glass contacts), I live in AZ where it's dry, but I might silicone bead the exterior. Easy peasy.... and looks like it was always there. The instructions were ok, not spectacular. One thing we guessed at was the interior frame had 3 hole/slots for the top or bottom??? No markings for which way up, so we decided to put them on the bottom as drainage?? ?